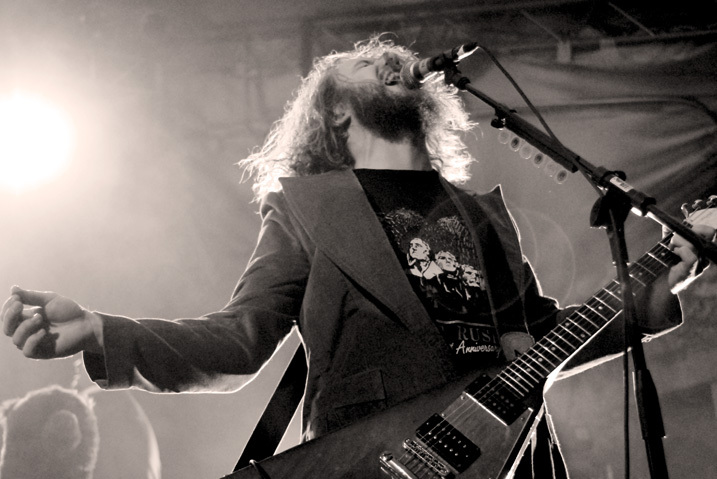 Jim James of My Morning Jacket – bringing a healthy dose of ethereal to the proceedings. Something homegrown this weekend – a concert from My Morning Jacket, recorded in Chicago on June 17, 2011. Since MMJ’s Jim James has been criss-crossing the country the past several weeks, on a solo tour – and everybody I ran into at his L.A. show a few weeks back were such diehard MMJ fans, I had to run this one as a way of getting those of you unfamiliar with him and them a chance to get acquainted. Because they are one of the reasons the current state of music is in such good shape (despite what you hear from the mainstream). I just finished listening to the 30th anniversary concert by The Flaming Lips at the BBC earlier this week, and I’m reminded that what binds these two bands together (and a number of others who share a similar musical temperament) is a common thread of constant reaching; perpetual innovation and a love of doing what they’re doing. They don’t adhere to the mainstream ethic – and for that reason, in the case of Flaming Lips, have maintained a freshness and an ever-growing fanbase these past 30 years. MMJ have been at it for 15, and the result is the same. These are bands that aren’t going away. Fortunately for them, and us, they are weird enough to sustain and transcend Popular Culture for a good long time. In the case of My Morning Jacket, they are the next logical step in the progression of exploratory/experimental Rock Music. So if you haven’t become familiar with My Morning Jacket, but have heard about them or even if you haven’t, now’s your chance. And if you still don’t like them – come back in about 20 years and be amazed at how fresh they sound in all that time. Since the concert is over 2 1/2 hours long, it’s split up between two players. 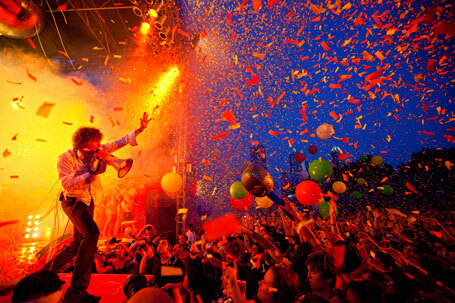 Newstalgia Backstage Weekend – The Flaming Lips – Live In Poland – 2010. Low-key would not be an apt description.